Gigs in big venues with prices to match are not where I usually find myself but, thanks to a spare ticket and the largesse of a good friend, yesterday evening I was in a very long queue to see Kraftwerk at the Brighton Centre. The anti-tout requirement for ID to verify named tickets, coupled with increased security searches in the current climate, meant the line snaked all the way to the rear of the venue; but it was a good-humoured queue and we ended up sharing bottles of Becks with a man from Hamburg and his grown-up kids. Very fitting. A Kraftwerk performance is not an ordinary gig: seated in orderly rows, all wearing our 3D specs with faces raised towards the giant backdrop screen that dwarfs the band, when I glanced back we looked like a congregation come to worship. Calling Kraftwerk a ‘band’ hardly seems appropriate: arranged in a line across the front of the stage, the German quartet resemble operatives on a production line. And on the far left is the foreman, the septuagenarian Ralf Hutter, the only remaining original member since Florian Schneider stood down in 2008. 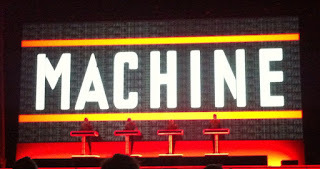 Having never seen Kraftwerk perform before, it was thrilling to experience those unique sounds in a live setting: the sub-bass was like a punch in the solar plexus and those familiar and much-sampled motifs from Trans Europe Express, Numbers and others were a joy to hear. I was delighted that all bar one of the tracks from 1978’s The Man-Machine LP were played: the title track, Spacelab, The Model, the beautifully evocative Neon Lights and The Robots make this, in my view, Kraftwerk’s outstanding album. Others will disagree, I am sure: there was a lot of warmth in the room for the quintet of tracks from 1981’s Computer World, if that doesn’t sound too oxymoronic, and Autobahn and Tour De France were greeted with cheers. The 3D graphics were superb and when the curtain reopened for the first encore, The Robots, the band had been replaced by animatronic doppelgangers. Ralf’s, obstinately not programmed in the same way as the other three, stood motionless for the most part and only came to life sporadically to throw some limited shapes. When the curtain failed to close at the end of the track, we were treated to the sight of the showroom dummies being manually removed from the stage. It was a timely reminder that, for all Kraftwerk's automative imagery, they are only human and there are people behind this peerless music.